Police have released a CCTV image of a man they want to speak to in connection with the theft of £1,000 of railway equipment in Gloucester. Staff reported that the Network Rail Depot at Gloucester Railway Station was broken into on Saturday 16 October. Investigating officer, PC Frank Hedley, said "a quantity of cable and an electrical transformer" was taken. 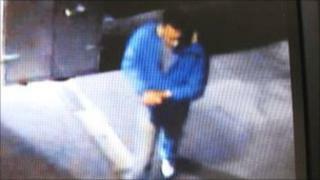 British Transport Police are appealing for help to identify the man seen in the footage.